It is very difficult to find entertainment in Singam 2, for it is unashamedly racist towards the African community. It also advocates corporal punishment in school as a means of keeping students from crime in adulthood. Lines implying that sort of nonsense are mouthed in the film with utter conviction by Saravanan Sivakumar, better known as Surya. That Surya utters those lines certainly does not make them any less racist or regressive; but the star wattage of the actor, not to mention the sheer cartoonishness of the movie, might perhaps have marginally diminished the negative impact. Surya, who turns 38 this month, is the son of Sivakumar, the nearly-man of Tamil cinema, who enjoyed some success in the 1970s as a leading man and then won acclaim playing older roles after being subsumed by the Rajnikanth-Kamalahaasan wave, setting those two in pole position like MGR and Siv­aji Ganesan in the preceding decades. In 1997, Surya debuted with his contemporary Vijay, already five films old, in S.M. Vasanth’s Nerukku Ner, produced by Mani Ratnam’s Madras Talkies banner. The film played out like a rehash of Ratnam’s Agni Natchathiram (1988) with Karthik and Prabhu’s warring step-brothers replaced by warring co-brothers-in-law (the males in a brother-sister ‘exchange’ wedding). Vas­a­nth’s Poovellam Kettuppar (1999) featured Nassar and Vijayakumar as an estranged music-composer duo whose children (Surya and Jyothika) strive to bring them tog­ether. Surya eventually married Jyothika in 2006. Unlike Vijay—the son of S.A. Chandrashekhar, a purveyor of pot-boilers who directed Surya in Periyanna (1999)—who has stuck to the crowd-pleasing ‘masses’ trajectory, untouched by any need of acting skills, Surya, guided by his father, an award-winning actor, chose the Kamalahaasan path of alternating bet­ween roles for the ‘masses’ and for the ‘classes’. He was fortunate in that his arrival coincided with the flowering of fresh new directorial voices. Bala had revived actor Vikram’s dormant career with Sethu, his directorial debut. Surya was next to benefit: in Nandha (2001), Surya’s portrayal of a convict trying to reintegrate into society won him best actor at the Tamil Nadu state film awards. The next year, debutant Ameer Sultan cast Surya in Mounam Pesiyathe, a successful romcom. Some years on, Surya’s brother Karthi debuted in Sultan’s seminal Paruthiveeran (2007). Another new directorial voice, Gau­tham Menon, had arrived with the hit Minnale (2001) and its flop Bollywood remake Rehnaa Hai Tere Dil Mein the same year. For his next, Kaakha Kaakha (2003), he cast Surya after being impressed by his performance in Nandha. Surya’s lean-mean supercop in the film created the template for bigger, brasher versions. Surya and Menon would team up for the memorable Vaa­r­a­nam Aaayiram (2008) where the actor played fat­her and son. Surya’s first double role, however, was in Sasi Shanker’s Pera­zhagan, in which he played the twin roles of a hunchback and a college student. He won the Filmfare (South) best actor award. By then, awards were coming fast. He won the Filmfare best supporting actor for playing an ebullient conman in Bala’s Pitamagan (2003); he also won critical acclaim for playing a student leader in Mani Ratnam’s Aaytha Ezhuthu. Though most of these films starring Surya were box-office successes, his public image was still on the ‘class’ rather than the ‘mass’ trajectory. What he didn’t get was the wolf-whistling front-bench appeal. It changed with A.R. Murugadoss’s Ghajini, in which Surya plays a violent man with short-term memory loss (the filmmakers say they were not inspired by Christopher Nolan’s Memento). Though Kaakha Kaakha was a hit, it was still seen as a different, thinking man’s film. Ghajini’s blockbusting success firmly banished those thoughts. And thus began the next phase of Surya’s character that continues to this day. The director Hari, who had served up the action cop drama Saamy (2003), starring Vikram, joined hands with Surya for Aaru (2005), in which the actor plays a Fagin-like­—only much younger and fitter—leader of a gang of youth. It was the beginning of an enduring partnership. Pausing only to make the separated-at-birth action drama Vel (2006), the Hari-Surya team created Singam (2010). With the film’s roaring, fiercely moustached cop Dor­aisingam, who is endowed with sup­er­human strength—northerners, think only of the Devgan turn—Surya’s image joined the larger-than-life pantheon. It hasn’t always been great going for Surya since then, his reteaming with Murugadoss in the sci-fi film 7aum Arivu (2011) saw him dormant for long stretches of the film and inexplicably, Shruti Haasan, clearly unable to carry the narrative weight, was placed front and centre. The film just about turned a profit. His experiment playing conjoined twins in K.V. Anand’s Maatrraan did not find much favour with the ‘mass’ audience but nevertheless made a small profit thanks to his loyal fan base. This fan base has not thought fit to bestow Surya with an epithet. His contemporaries all have one: Vijay is Ilayathalapathy; Ajith Kumar is Thalai; and Vikram is Cheeyan. Surya is just Surya. Some fans call him Nadippin Nayakan, that manages to combine Sivaji’s Nadigar Thi­lagam and one of Kamalahaasan’s most famous roles, but it’s a title not widely used. Perhaps the star is content without a ‘mass’ title. He’s happy producing films and with his charity, which keeps him busy when he’s not acting. The ‘mass’ element is clearly back with Singam 2, a film with enough app­eal for the meanest of tastes and often specifically for them, and is loud enough to wake the dead, and clearly they have risen and made their way to the turnstiles, as the producers have reported a global opening weekend of Rs 50 crore. 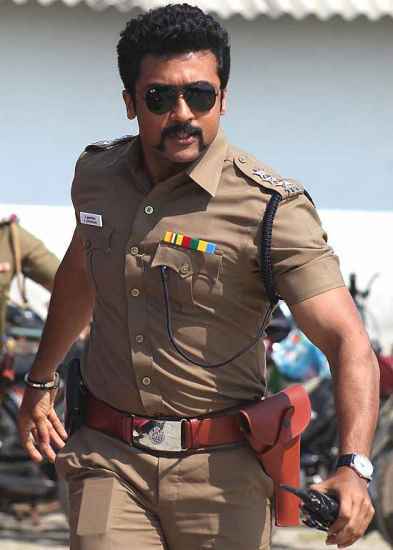 Singam 2 arrives at an interesting time for Tamil cinema. On the one hand, films like Murugadoss’s Thuppakki, starring Vijay, with its gross of Rs 180 crore, proves that there is a market for action. On the other, the recent success of low-budget, high-concept films with no big stars, like Pizza, Naduvula Konjam Pakkatha Kaanom, Neram and Soodhu Kavvum shows that the Tamil audience is hungry for alternative content. Surya—to a lesser extent Vikram—is the best placed star to exploit both. Gautham Menon’s Thuppariyum Anandan, a detective thriller set in the 1980s, is supposed to be Surya’s next film. Perhaps that could be the one that will straddle the two worlds. Stars with Jyothika in this romantic comedy. Eventually, he wed the actress in 2006. Template for the ruthless cop with a heart of gold that sparked many louder versions. Big hit. Plays a man with a memory affliction trying to avenge the death of his lover. Won Filmfare award.